Buying your own home is everyone’s dream. When making this crucial decision first choose which neighborhood or development to consider. Think which neighborhood is right for you. There are plenty of factors to consider. You have to think about location, view, size, number of bedrooms, neighbors, security and so on. It is worth having a definite checklist of what you are looking for in a home. When buying a home to live in, it should be completely suitable for you and your family. how do you make the final selection? 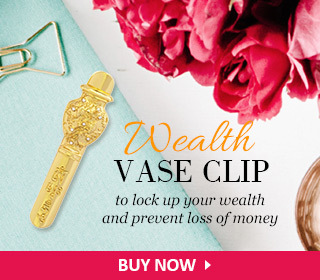 A very vital factor you should not leave out from your checklist is the feng shui factor. When a house has good feng shui, it can spell the difference between success and failure, happiness and misery. You often see the fortunes of families change after they move into a new home, because their feng shui will also change. Feng shui is about the chi energies in your surroundings, more specifically the chi energies around your home. The good thing about feng shui is that it is not black and white. A home can be perfect for one family, but less suitable for another. 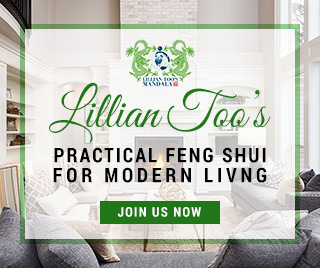 The important thing to do when choosing your home with feng shui in mind is to understand what makes good feng shui from an overall perspective and from the perspective of your family. Starting with the overall development, we first identify the facing direction of the entire property development. This is typically signified by the entry passageway into the development site or the first point of entry. This is considered as the point where the strongest yang energy enters the development. Land formations play a big role in determining the facing direction. If there are large bodies of water or mountainous formations in the vicinity of the site, the overall site plan can be taken to identify the general direction that the development is focused towards. After determining the facing direction, superimpose the flying star natal chart onto the overall site plan to identify which areas would be most beneficial to purchase. Identify sectors with auspicious water and mountain stars, and see if any land formations are present in these sectors such as bodies of water (such as lakes, rivers, streams) or rock formations (mountains, hillocks) to enhance these stars further. 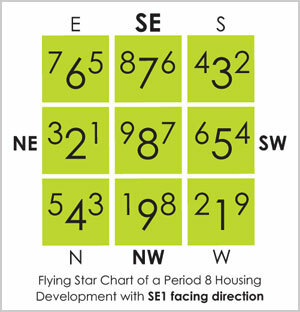 To take a specific example, if you determine that a particular housing development faces Southeast 1 (Period 8 chart), looking at the relevant Flying Star natal chart shown above, an auspicious sector would be the Southwest, where the combination of water star 4 and mountain star 6 brings windfall luck to the sector, thereby bringing this same kind of luck to houses located within that sector of the overall development. Women in particular will do well in this sector, so houses in the SW of this development will benefit families where the matriarch has a large influence, or is a major breadwinner for the family. Or take the Northwest, which houses the water star 8 of the development, houses in this sector will generally benefit from wealth and income luck, with the patriarch of the family doing particularly well. Families whose main breadwinners are the fathers of the family would make full use of the kind of chi they get from their Northwest located house in a SE1 facing development. However, we may never get the locations we aim for due to the limited supply of houses. So in the event you are leaning towards buying a residence in a sector which may not have the best flying stars, you should identify which house within that sector would be beneficial to you and your family. 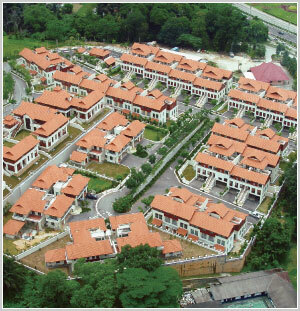 Take for example houses in the North corner of the development, which houses the 5,3 stars. Identify the house which is ideal to control these star afflictions. Because number 5 is a malignant earth star, and number 3 is a quarrelsome wood star, the use of the element of metal will exhaust the #5 misfortune star as well as destroy the #3 argumentative star. The most ideal scenario would be a residence that is constructed in a form that reflects the element of metal or with a curvaceous shape (the shape of metal). Paint such a house white or grey as the overall colour theme to symbolize the element of metal to control the star afflictions. 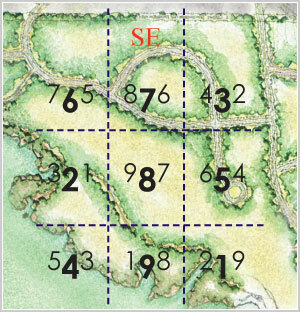 After selecting which area you want to live in, the next step is to identify which house to pick within that area. The key criteria for selecting the house would be to study and understand the floor plan of the unit and use the following tips. Minor renovation rules will also come into play when you select your home. Find the ideal facing location where you can angle the direction of the main door to suit the Kua of the head of the family or main breadwinner. Be sure the front door of the house is not facing the Chueh Ming (total loss) direction of this person. For example, a North-facing front door can be tilted to the Northwest or Northeast if the head of the family is a West group person. Or a Northeast-facing door can be angled to face North or East to suit an East group person. Do note that repositioning the main door in this way will change the Eight Mansions feng shui of the door, BUT it will not affect the Flying Star natal chart of the home, which is based on facing direction of the building and not just of the main door. Some other factors that are important to consider are the landforms surrounding the house in question. Is there enough open space surrounding the house to ensure free flow of energy? Is there a bright hall in front of the home for precious chi energy to settle before entering the home? Is the Green Dragon White Tiger armchair formation ideal, and if it is not, is it easy to rectify? Don’t select a house design that is cluttered with too many barriers or walls that inhibit the flow of chi energy around the home. A house that appears to be falling out of its compound will not appear balanced thus cannot be good feng shui. Similarly, look out for features such as open-faced staircases where you can see the zigzag profile of the stairs. Cover up such features with an interior design once-over before you move in. Identify any other such poison arrows and ensure they can be fixed before you buy a house. If they cannot be fixed, don’t settle for second best. Your home and the feng shui of your home is probably your most important investment, because the kind of luck you enjoy in it will determine how happy and how wealthy your family can become. Ensure the bedrooms are suitable for family members based on their individual KUA numbers. Remember not everyone is able to sleep in a sector with good flying stars. But it is just as important to sleep in the room which is favorable to your kua number. Be sure the bed headboards are able to be positioned to tap one of the individual person’s auspicious directions without being positioned in an awkward or diagonal fashion.